Legislator William Lindsay III has released the following message. 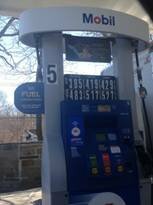 Hauppauge, NY - July 28, 2014 - Perhaps you had this experience: Driving into a gas station after seeing a large street sign posting the price and pulling up to the pump expecting at worst to pay around ten cents more per gallon for using a credit card. Noticing the signs at the pump you are shocked to find out that the credit card price is a dollar more than the cash street sign price. If you discover this before beginning to pump, you drive away searching for another station (which in itself is an annoyance). If you discover it too late, you experience that feeling of being ripped off having been charged in some cases an extra $20 on top of the regular cost. If you’re driving a big SUV that could equal $105 for 1 tank of gas. After much public outcry along with 2 of my fellow Legislators I was able to introduce legislation that will hopefully prevent this. IR 1637 (A Local Law To Provide Truthful Advertising At Gasoline Stations) would require gasoline stations to advertise the higher price on the street so that customers are aware of the exact prices they will be paying before pulling up to the pump. The legislation provides an exemption for retailers when the price differential between their cash and credit transactions is less than 5%. The gasoline retailers have been aggressively lobbying in opposition to this bill primarily complaining about the cost for the extra signage and the fees charged by the credit card companies. However, since the vast majority of retailers fall under the 5% exemption, the law would be of no cost to them. The percentage charged by the credit card companies is already less than 5% meaning the profit for credit card purchases is the same if not higher than cash purchases. The law would only affect those few retailers that are overcharging with the credit card price. As a firm believer in the free market I would never attempt to dictate how much any industry should charge for their services, however as an elected official I have a fiduciary responsibility to the protect the public from any deceptive business practice. If gasoline stations choose to follow this business model that is their prerogative. This bill is simply trying to get gasoline stations to be more open and honest with their customers. If you are charging this insanely high price good luck to you but no industry should rely on trickery as part of their business plan. There is a public hearing on IR 1637 this Tuesday July 29th at 2:30 PM at the William H. Rogers Legislative Building in Hauppauge, North County Complex (North Side of Veterans Highway). Many representatives from the gasoline retail industry will be voicing their opposition to the bill. Please come out and be heard on Tuesday before this practice becomes the new industry norm. I know we all live very busy lives and if you are unable to attend in person but would still like your voice to be heard please email any comments that you would like to have entered into the record under your name. If you find this all hard to believe see the picture above, as a picture is worth 1,000 words. $5.27 for Super. Subject: LongIsland.com - Your Name sent you Article details of "Gasoline Stations Charging Up to 25% Surcharges for Credit Card Users"